Silly Sir Brewing Co.Eisbock! Ice-Beer! Accident averted! - Silly Sir Brewing Co.
January 13, 2016 - No Comments! Eisbock is typically a term given to beers that have been created by freezing off a portion of the beer's water and then discarding it so as to increase its percentage of alcohol and elevate its maltiness. Typically an eisbock (German for ice strong-beer) has an alcohol percentage of around 10% or more. The alcohol levels levels for this beer however were much lower. This beer had a huge problem that needed a solution. 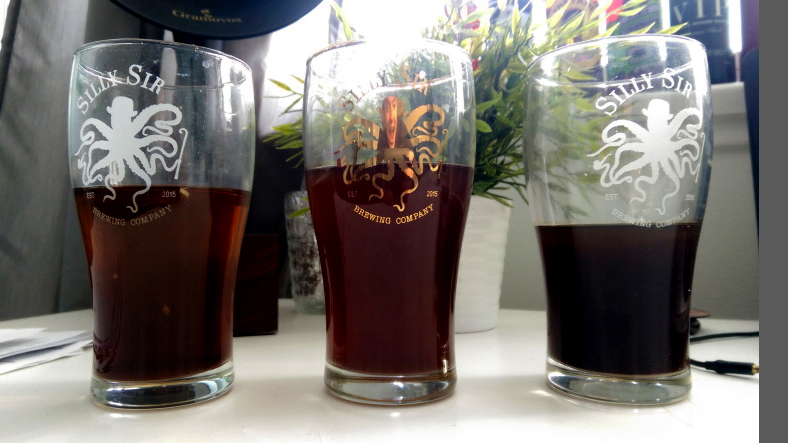 I wanted to brew two-1 gallon batches of the same beer together into a single 2 gallon batch, but grossly miscalculated the absorption of water into the grain, and sparge water amounts. 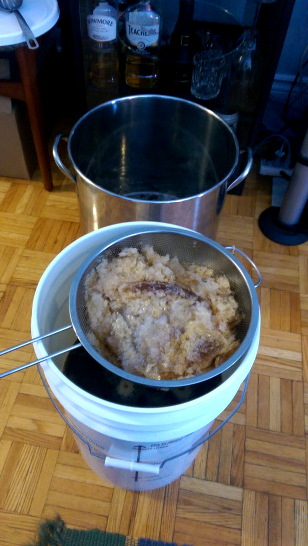 I ended up with about 4-gallons of beer in the fermenter, roughly double what I had intended. The beer was extremely diluted. I was concerned I'd ruined a brew day. Annoyed, I began to consider how I might be able to fix this problem. If I hadn't already cooled the beer and pitched the yeast, I could have just left it on the burner to boil off most of the water and achieve the proper volume of wort. I didn't do this because I had no extra yeast to pitch. If I brought it back to a boil, it would die. I knew there had to be a solution to my problem but wasn't sure what it was. I knew alcohol had a much lower freezing point than water, and I also knew it was winter and that I could leave it out on the balcony to freeze it. I checked online to see whether anybody had ever frozen their beer to elevate their alcohol percentages, and came across this "eisbock" thing. I'd never even heard the term before. 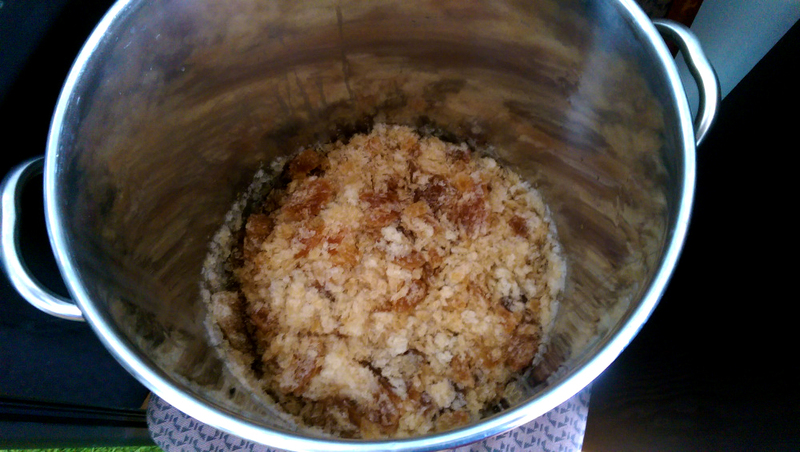 …before discarding it in my boil kettle. 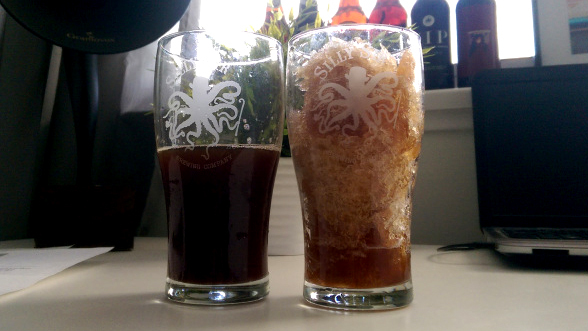 Basically, you just partially freeze the beer after it's done fermenting, and skim a crap ton of ice from the top. I got rid of approximately half of the ice to bring the alcohol levels to within a "normal" range. I estimate that the ABV is between 3-4% now, which while quite low is a substantial improvement from 1.5-1.9% which I estimate it was at before my experiment. I don't think it's quite doubled as I'm sure I discarded some alcohol that was encapsulated in the ice too, but the beer now tastes much fuller, and has been saved. I use the eisbock term liberally. This is not a "strong-beer" by any means. Still, I'm proud of how I was able to rescue a beer that would otherwise have been dumped. It is now on tap in the Silly Sir keg, and ready for consumption by friends, family, and let's be honest: mostly myself. Have you ever had to rescue a beer from certain doom? What was the problem, and what was the solution? Let me know in the comments below.